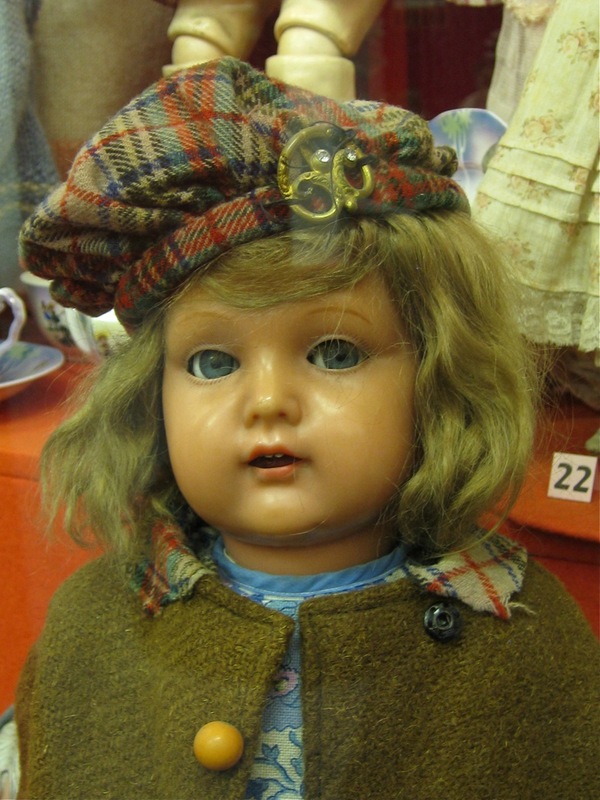 In addition to visiting as many gorgeous castles and palaces as we could manage on our trip to Scotland, I had my own "doll tourist" agenda to follow. When I lived in Edinburgh, the only doll source I was aware of was the toy section at the Jenners department store. My favorite things to browse at this store were the beautiful Sasha dolls and the numerous Playmobil sets. I also remember the realistic Beswick porcelain horses in the home department that I would admire while my parents were looking at dinnerware. Before we left Edinburgh, I wanted to return to Jenners (now owned by House of Fraser) to see how the toy selection had changed over the years. I also wanted to visit Smyths, because my online searches suggested that this store is similar to Toys R Us--one of my favorite Maine haunts. In addition, I took Nealie's advice and stopped in at the Edinburgh Museum of Childhood to admire their collection of antique dolls and dollhouses. Many of you guessed correctly that we are vacationing in the United Kingdom, and three of you guessed it exactly. Very well done Filip, Anna and jSarie! We are, indeed, in Edinburgh, Scotland--a city where I lived for a while when I was a child. I have been waiting a long time to show this special place to my family. My new Makie doll, Effie, is a perfect companion for this journey--not just because she's charming and versatile, but because she was made in the UK, and so this gets her back a little closer to her birthplace of London, England. The first thing we did when we arrived in Edinburgh was to climb the hill (mountain!) in the middle of the city. It's called Arthur's Seat--perhaps named after the legendary King Arthur, and it offers spectacular, panoramic views of the city. 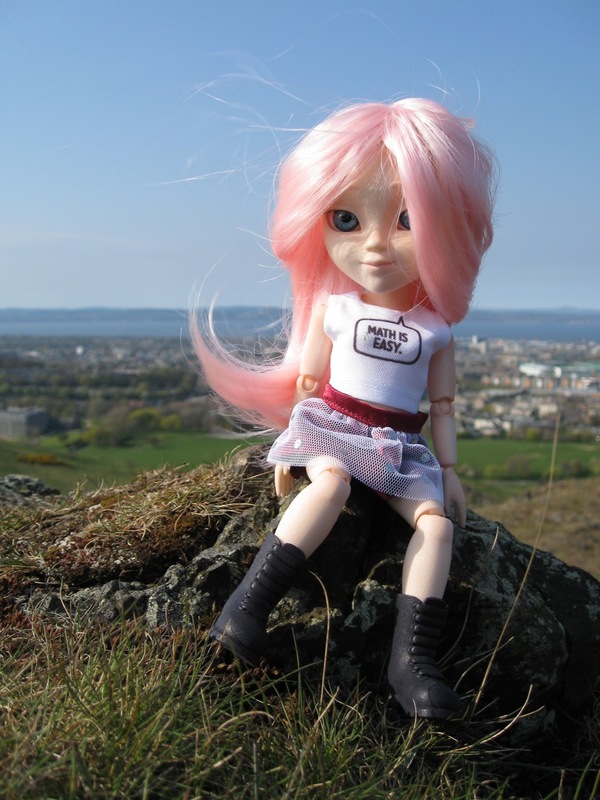 New Makie doll, Effie, on Arthur's Seat, Edinburgh. The Cute New Makie Face from MakieWorld! I have been waiting for just the right moment to introduce you to my second Makie doll, Effie. Effie has the new Makie face that was introduced last November. The new dolls still have customizable faces, just like my first Makie, Glythia, it's just that the basic face shape has been changed. Ever since I got my first peek at this fabulous new face shape, I have wanted to buy another Makie doll. I figured that this wish would have to go to the bottom of a very long waiting list...but I was wrong. Several months ago, I got an unexpected email. Stephanie, a fellow fan of the Makies, wrote to say that she had a coupon worth an entire new doll...and she wanted to give it to me (!). I was surprised by the fact that MakieWorld would have coupons worth so much, and completely stunned by the generosity of this offer. 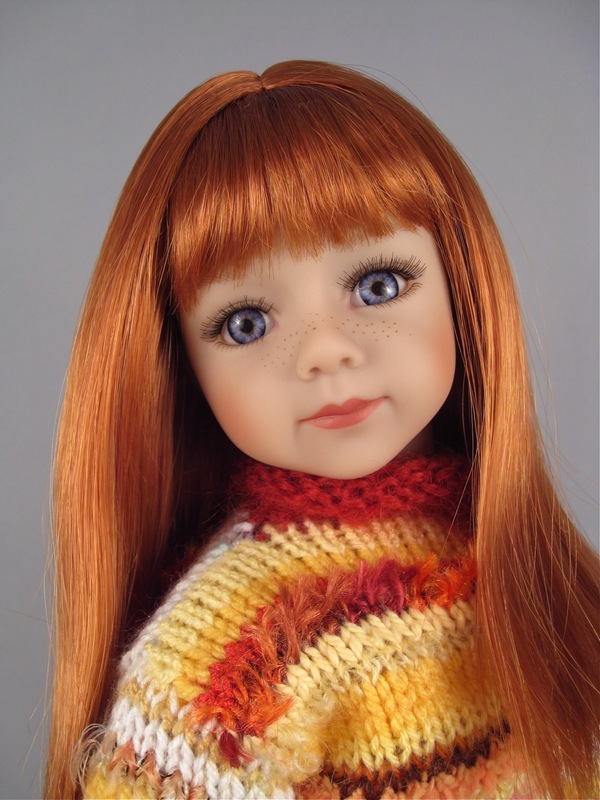 All that Stephanie asked for in return was that I share a few pictures of my new doll here on the blog. Well. I can do better than a few pictures, I hope. My new "Cutie" face Makie doll from MakieWorld. I have to admit that I am still obsessed with the global Frozen doll shortage, and I spend a certain amount of time every week checking the Disney Store inventory and browsing secondary market sales online. EBay prices on these dolls have come down a little bit since my last Frozen doll review, but it can still cost $40 for the Disney Store Classic Elsa doll, and closer to $70 for an Anna and Elsa pair. While I was browsing eBay a few weeks ago, I noticed a two-doll set of Anna and Elsa selling for $18 with free shipping. This is actually lower than the original Disney Store retail price for this sister set. On closer inspection of the dolls, however, I realized that they are not authentic Disney Store dolls, but rather knockoffs selling directly from China. They did look like reasonable imitations, though, complete with a high level of articulation. Because I am inexplicably fascinated by cheap knockoffs, and because I noticed that a lot of people seem to be purchasing and bidding on these dolls, I figured it might be a good idea to do a quick review. 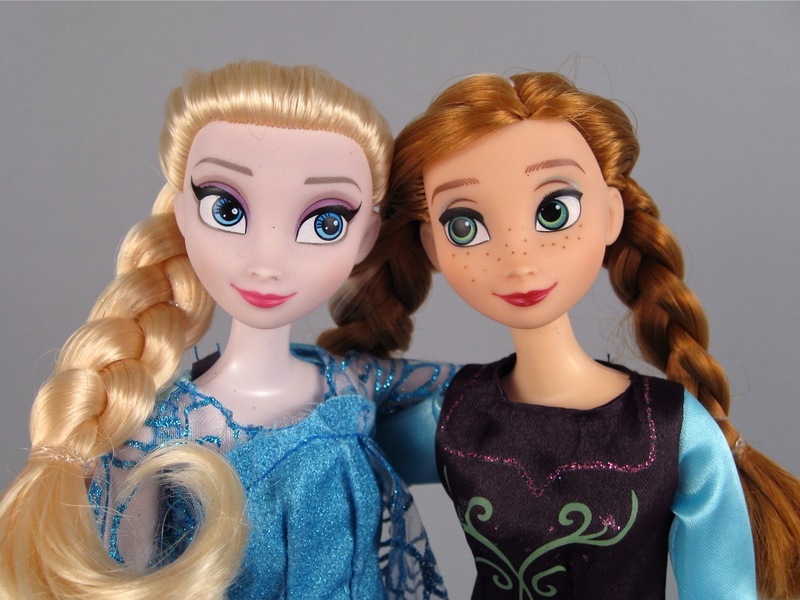 Counterfeit Elsa and Anna dolls from China. Maru and Friends Doll, "Savannah"
Maru and Friends offers a small collection of 20 inch, high-quality, all-vinyl play dolls. The dolls were created by Maritza Gutierrez with the idea of putting beautiful, realistic, culturally diverse dolls into the hands of children. The central character, Maru, is described as a Latina girl who moved to America in search of a better life. Maru has found some wonderful new friends to give her support and help ease the transition into her new situation. These friends (Jamie, Savanna, Raven and Tanya) make up the rest of the doll collection. Maru and Friends dolls can be purchased for $115 at the company's online store or at the Aventura Mall in Miami. These dolls can also be found online for £109 at the lovely My Doll Best Friend shop in the United Kingdom. 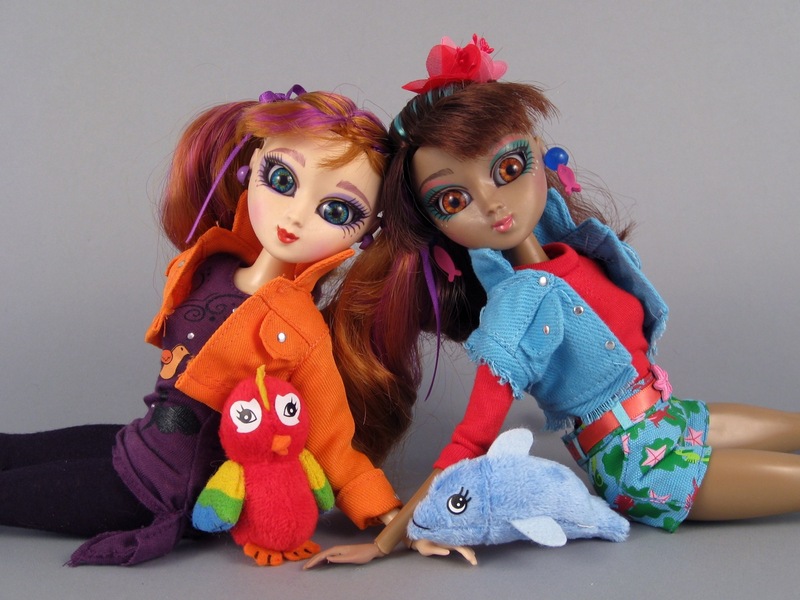 Maru and Friends® doll, "Savannah"
Zeenie Dollz "Yana" and "Evee"
Zeenie Dollz are 13" articulated fashion dolls built around a theme of animal protection and environmental preservation. The dolls were designed by a mother and daughter team and introduced onto the market last year. At the moment, there are six characters to choose from, and they retail for a whopping $50 on the Zeenie Dollz website and for $40 or less on Amazon. The dolls are also available at Wayfair, Walmart (online), and a few other locations. The Zeenie Dollz are called "Eco Warriors," and each has a character description focused on protecting some region of the environment. For example, the character named Kazumi is the steward of the polar regions. A portion of the purchase price of each doll is given to organizations like Heal the Bay, the American Society for the Prevention of Cruelty to Animals (ASPCA), and Greenpeace. The Zeenie line is manufactured with an effort to be ecologically friendly, which means that the dolls and packaging are made from non-toxic, recyclable materials. Initially, I thought that the dolls were made from recycled materials, which would have been awesome, but this is not the case. Zeenie Dollz Evee (L) and Yana (R). Apple White's Fainting Couch for Ever After High--A Guest Review! I have had several guest posts lately, I know, but I simply couldn't resist sharing this review with you as soon as possible. Lulu from The Doll Mag offered to showcase the tempting Ever After High Fainting Couch, and not only do I like the look of this toy, I love the Doll Mag. If you haven't visited that site yet, it's an online blog and magazine with all kinds of doll-related articles, recipes, crafts and activities. The magazine is expertly assembled, and the blog posts are beautifully done. Everything at the Doll Mag is bright, colorful and inviting. Lulu and her sister, Bella, were kind enough to mention my blog in their January Staff Picks, a feature similar to the Doll Diaries' Picks of the Week. I find summary posts like these very helpful. I also highly recommend Doll Mag's in-depth look at the American Girl Campus Snack Cart. That was my absolute favorite toy at the American Girl store in Boston. Without further delay, here's Lulu to tell you all about Apple White's couch. Thank you so much, Lulu! Apple White's Fainting Couch, for Ever After High.